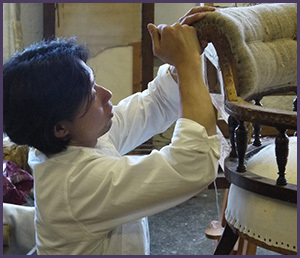 The Oxford School of Upholstery has over a decade of experience in delivering upholstery workshops and courses, as well as providing a full upholstery and soft furnishing service throughout the UK. Students who join us for one of our courses have the benefit of working in an active studio, giving them a unique insight into how the upholstery business works first-hand. Our courses are suitable for passionate beginners, right the way through to seasoned enthusiasts looking to enhance and develop their career in the industry. Respected and experienced professionals deliver our courses to the highest standard. Class sizes are small, so you will receive ample time and attention to your projects and development. 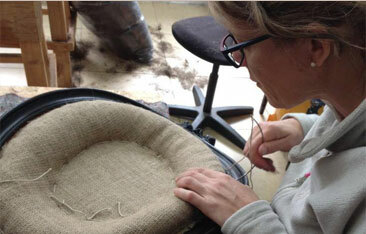 “I have worked in the upholstery business for over a decade. I feel such a sense of accomplishment when I transform an old piece of furniture into something fresh and modern that will last for many years to come. I also love transferring this skill to our students here at the Oxford School of Upholstery, ensuring this unique and timeless craft is continued and celebrated.” – Stuart Bottomley, owner at the Oxford School of Upholstery. 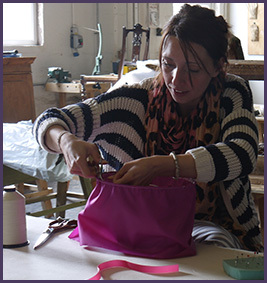 Click here to find out more about our upholstery courses and to book your place. The Oxford School of Upholstery works alongside our team of highly skilled upholsterers in the Oxford Upholstery workshop which takes on commissions, offering an exceptional upholstery and soft furnishing service to private customers as well as the contract market while bringing expertise and knowledge to the school. Working in this environment students can see first hand the day to day running of a busy workshop. We also sell a beautiful selection of fabrics and our hand-made, upholstered furniture including hand-sewn lampshades, drum lampshades, headboards and ottomans. sideboards, coffee tables and headboards. Oxford is one of the UK’s most famous cities. It is most well known for its university, which attracts renowned scholars and academics from across the world. It’s also a super convenient location, easily accessible from London and Birmingham with excellent road, plane and train links. If your passions and interests go beyond upholstery, to art, architecture history, politics or philosophy, then Oxford is the perfect place for you to learn. To find out more about Oxford and where we’re based, just click here. Why Should You Learn Upholstery? Over the past few years, we’ve seen a real surge in the number of people wanting to learn the traditional craft of upholstery. We’re all spending more and more hours in front of our computers, and upholstery offers a therapeutic way of using your creativity and imagination. Our students’ love building something tangible and beautiful that will last a lifetime that they can share with their loved-ones. It’s also a fun activity to do with your friends! Our more extended courses offer you the opportunity to develop your skills and abilities, giving you the confidence to work independently. 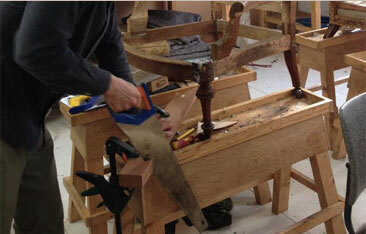 We give our students a solid foundation in the craft of upholstery and many have gone onto start their own businesses. There’s nothing we love seeing more than our students developing their own unique styles and creating a lifestyle from something they love. I have some experience. Can I still benefit? How strong do you have to be to take a course?